What do you think of when you think of an anchor? Now you can mix, pour and serve from the same bowl, with Anchor's Batter Bowl. This thick, glass mixing bowl features an ergonomic handle and non-spill pouring spout, so when you're done beating and stirring your delicious chocolate brownies you can pour them straight into the pan without leaving any mess on your kitchen benchtop. 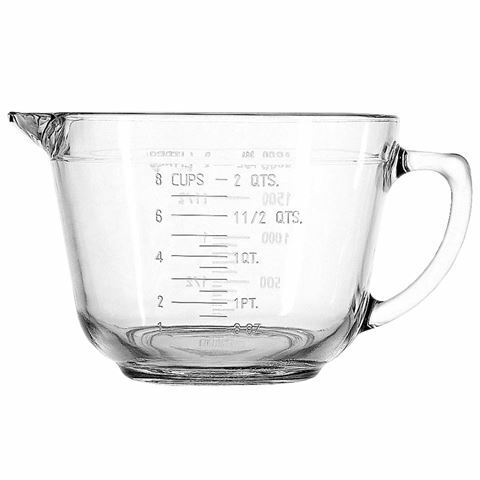 You can also ensure that your recipe remains accurate by using the convenient measurement units embossed on the side of the bowl, which offer both metric and imperial units. Made from Anchor's tough tempered glass. Ergonomic handle and non-spill pouring spout allow for easy pouring. Measurement units, in both metric and imperial units, are embossed on the sides of the bowl. Dishwasher, oven and freezer safe. Capacity: 2 Litres (8 cups).